Gerbils were one of the first pets I remember having. Frisky and Finicky were their names. I could sit and watch them for hours. Fortunately, they didn’t do this to often. Q: What do gerbils do when they are frightened or excited to warn other gerbils? 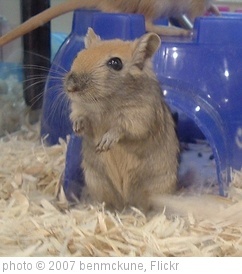 A: Gerbils thump their feet as an alert to other gerbils. It’s a form of their communication. They also use it to show they are ready for mating. Interesting. So I guess this means gerbils have very good hearing cuz how loud could a hamster really thump?